Applewood Air is a local heating and cooling company located in Mississauga, Ontario. Our with with Applewood was done through an agency partner in the Ontario region. 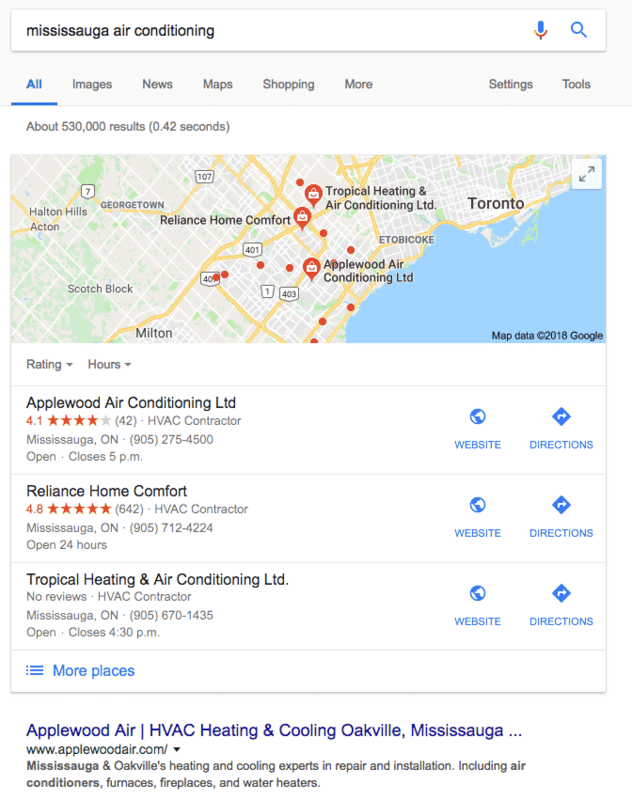 Applewood Air had ran organic search engine optimization campaigns in the past trying to break into the competitive Toronto market with minimal success. We were brought in to both continue the campaign and provide additional insights and innovations to help the growth of organic traffic and leads. Toronto is one of the most competitive local markets in Canada for many things, organic SEO included. Our major challenge was developing a plan that would increase local visibility and drive targeted traffic to the business, while educating the client that the highly competitive and high volume "Toronto" keywords were not necessary. We also faced potential hostile actions from the previous SEO provider that could impact the success of the campaign and reflect poorly on our efforts. The first step in any campaign, especially one that we did not start, is to audit. See what has been doing and what direction things are moving. From here, we took an education-based approach and agreed that dominating the local suburb in which Applewood Air was physically located was the better use of time and resources, over trying to target the more competitive city terms. From here, we optimized the website's structure and content, leveraging the years of high quality blog post content to create internal signals of relevance within the local suburb. Since Applewood Air already had a high quality brand in the local market, we were able to build local relevance signals through citations and link acquisition. After we had our strategy laid out, we continued to work towards acquiring and building the relevance for both the industry and the location. By turning our focus on the local suburb we were able to quickly dominate both the maps and organic results. In addition to the above search term, the majority of tracked keywords trended positively over the campaign. Now that we have established the website within the local suburb, we are continuing the process for each of the other local suburbs in which Applewood Air serves clients.